As we head into the summer holidays, we’ve been thinking back on the last year at Sound Connections and the stories and topics that have particularly caught our attention and imagination. Here are some of our resource and news highlights covering all our priority areas: Early Years, Youth Voice and Participation, Challenging Circumstances and Sector and Workforce Development. Early Years – In this study, workshop leader John Webb explores the question of gender in early years music practice and how it may affect our practice. Youth Voice and Participation – We are so excited to have recently recruited two Wired4Music Trustees to the Sound Connections board. Read our top tips and consider how you might involve young people in governance in your organisation. Challenging Circumstances – Our SEN/D consultancy activity continues to take us on a fascinating journey. 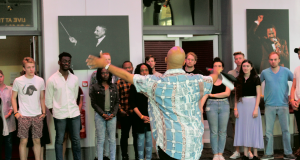 In this news article we reflect on the work of innovative organisations leading the way and how inclusive music making finally has a seat at the table. Sector and Workforce Development – In this brilliant piece from Camden Council, we hear about one woman’s inspiring mission to skill-up practitioners and embed music in early years settings across the borough. Thank you to all those who have contributed to the Sound Connections resources and news items this year. We welcome contributions from all Sound Connections members, so if you would you like to highlight your work, or contribute to the Sound Connections resource bank, please contact us to discuss it further.